This article is about the Hijri calendar based on lunar observation. For the solar calendar whose first year is fixed to the Hijra, see Solar Hijri calendar. For the rule-based Hijri calendar, see Tabular Islamic calendar. The Islamic, Muslim, or Hijri calendar (Arabic: التقويم الهجري‎ at-taqwīm al-hijrī) is a lunar calendar consisting of 12 lunar months in a year of 354 or 355 days. It is used to determine the proper days of Islamic holidays and rituals, such as the annual period of fasting and the proper time for the pilgrimage to Mecca. The civil calendar of almost all countries where the religion is predominantly Muslim is the Gregorian calendar. Notable exceptions to this rule are Iran and Afghanistan, which use the Solar Hijri calendar. Rents, wages and similar regular commitments are generally paid by the civil calendar. The Islamic calendar employs the Hijri era whose epoch was established as the Islamic New Year of 622 AD/CE. During that year, Muhammad and his followers migrated from Mecca to Yathrib (now Medina) and established the first Muslim community (ummah), an event commemorated as the Hijra. In the West, dates in this era are usually denoted AH (Latin: Anno Hegirae, "in the year of the Hijra") in parallel with the Christian (AD), Common (CE) and Jewish eras (AM). In Muslim countries, it is also sometimes denoted as H from its Arabic form (سَنة هِجْريّة, abbreviated هـ). In English, years prior to the Hijra are reckoned as BH ("Before the Hijra"). For central Arabia, especially Mecca, there is a lack of epigraphical evidence but details are found in the writings of Muslim authors of the Abbasid era. Inscriptions of the ancient South Arabian calendars reveal the use of a number of local calendars. At least some of these South Arabian calendars followed the lunisolar system. Both al-Biruni and al-Mas'udi suggest that the ancient Arabs used the same month names as the Muslims, though they also record other month names used by the pre-Islamic Arabs. The Islamic tradition is unanimous in stating that Arabs of Tihamah, Hejaz, and Najd distinguished between two types of months, permitted (ḥalāl) and forbidden (ḥarām) months. The forbidden months were four months during which fighting is forbidden, listed as Rajab and the three months around the pilgrimage season, Dhu al-Qa‘dah, Dhu al-Hijjah, and Muharram. Information about the forbidden months is also found in the writings of Procopius, where he describes an armistice with the Eastern Arabs of the Lakhmid al-Mundhir which happened in the summer of 541 AD/CE. However, Muslim historians do not link these months to a particular season. The Qur'an links the four forbidden months with Nasī’, a word that literally means "postponement". According to Muslim tradition, the decision of postponement was administered by the tribe of Kinanah, by a man known as the al-Qalammas of Kinanah and his descendants (pl. qalāmisa). Different interpretations of the concept of Nasī’ have been proposed. Some scholars, both Muslim and Western, maintain that the pre-Islamic calendar used in central Arabia was a purely lunar calendar similar to the modern Islamic calendar. According to this view, Nasī’ is related to the pre-Islamic practices of the Meccan Arabs, where they would alter the distribution of the forbidden months within a given year without implying a calendar manipulation. This interpretation is supported by Arab historians and lexicographers, like Ibn Hisham, Ibn Manzur, and the corpus of Qur'anic exegesis. This is corroborated by an early Sabaic inscription, where a religious ritual was "postponed" (ns'’w) due to war. According to the context of this inscription, the verb ns'’ has nothing to do with intercalation, but only with moving religious events within the calendar itself. The similarity between the religious concept of this ancient inscription and the Qur'an suggests that non-calendaring postponement is also the Qur'anic meaning of Nasī’. The Encyclopaedia of Islam concludes "The Arabic system of [Nasī’] can only have been intended to move the Hajj and the fairs associated with it in the vicinity of Mecca to a suitable season of the year. It was not intended to establish a fixed calendar to be generally observed." The term "fixed calendar" is generally understood to refer to the non-intercalated calendar. Others concur that it was originally a lunar calendar, but suggest that about 200 years before the Hijra it was transformed into a lunisolar calendar containing an intercalary month added from time to time to keep the pilgrimage within the season of the year when merchandise was most abundant. This interpretation was first proposed by the medieval Muslim astrologer and astronomer Abu Ma'shar al-Balkhi, and later by al-Biruni, al-Mas'udi, and some western scholars. This interpretation considers Nasī’ to be a synonym to the Arabic word for "intercalation" (kabīsa). The Arabs, according to one explanation mentioned by Abu Ma'shar, learned of this type of intercalation from the Jews. The Jewish Nasi was the official who decided when to intercalate the Jewish calendar. Some sources say that the Arabs followed the Jewish practice and intercalated seven months over nineteen years, or else that they intercalated nine months over 24 years; there is, however, no consensus among scholars on this issue. Postponement (Nasī’) of one ritual in a particular circumstance does not imply alteration of the sequence of months, and scholars agree that this did not happen. Al-Biruni also says this did not happen, and the festivals were kept within their season by intercalation every second or third year of a month between Dhu al-Hijjah and Muharram. He also says that, in terms of the fixed calendar that was not introduced until 10 AH (632 AD/CE), the first intercalation was, for example, of a month between Dhu al-Hijjah and Muharram, the second of a month between Muharram and Safar, the third of a month between Safar and Rabi'I, and so on. The intercalations were arranged so that there were seven of them every nineteen years. The notice of intercalation was issued at the pilgrimage, the next month would be Nasī’ and Muharram would follow. If, on the other hand, the names relate to the intercalated rather than the fixed calendar, the second intercalation might be, for example, of a month between Muharram and Safar allowing for the first intercalation, and the third intercalation of a month between Safar and Rabi'I allowing for the two preceding intercalations, and so on. The time for the intercalation to move from the beginning of the year to the end (twelve intercalations) is the time it takes the fixed calendar to revolve once through the seasons (about 32 1/2 tropical years). There are two big drawbacks of such a system, which would explain why it is not known ever to have been used anywhere in the world. First, it cannot be regulated by means of a cycle (the only cycles known in antiquity were the octaeteris (3 intercalations in 8 years) and the enneadecaeteris (7 intercalations in 19 years). Secondly, without a cycle it is difficult to establish from the number of the year (a) if it is intercalary and (b) if it is intercalary, where exactly in the year the intercalation is located. Although some scholars (see list above) claim that the holy months were shuffled about for convenience without the use of intercalation, there is no documentary record of the festivals of any of the holy months being observed in any month other than those they are now observed in. The Qu'ran (sura 9.37) only refers to the "postponement" of a sacred month. If they were shuffled as suggested, one would expect there to be a prohibition against "anticipation" as well. If the festivities of the sacred months were kept in season by moving them into later months, they would move through the whole twelve months in only 33 years. Had this happened, at least one writer would have mentioned it. Sura 9.36 states "Verily, the number of months with Allah is twelve months" and sura 37 refers to "adjusting the number of months". Such adjustment can only be effected by intercalation. In the intercalated calendar's last year (AD/CE 632), Dhu al-Hijjah corresponded to March. The Battle of the Trench in Shawwal and Dhu'l Qi'dah of AH 5 coincided with "harsh winter weather". Military campaigns clustered round Ramadan, when the summer heat had dissipated, and all fighting was forbidden during Rajab, at the height of summer. The invasion of Tabak in Rajab AH 9 was hampered by "too much hot weather" and "drought". In AH 1 Muhammad noted the Jews of Yathrib observing a festival when he arrived on Monday, 8 Rabi'I. Rabi'I is the third month and if it coincided with the third month of the Jewish calendar the festival would have been the Feast of Weeks, which is observed on the 6th and 7th days of that month. In the tenth year of the Hijra, as documented in the Qur'an (Sura At-Tawba (9):36–37), Muslims believe God revealed the "prohibition of the Nasī’". The number of the months, with God, is twelve in the Book of God, the day that He created the heavens and the earth; four of them are sacred. That is the right religion. So wrong not each other during them. And fight the unbelievers totally even as they fight you totally and know that God is with the godfearing. Know that intercalation (nasi) is an addition to disbelief. Those who disbelieve are led to error thereby, making it lawful in one year and forbidden in another in order to adjust the number of (the months) made sacred by God and make the sacred ones permissible. The evil of their course appears pleasing to them. But God gives no guidance to those who disbelieve. The prohibition of Nasī’ would presumably have been announced when the intercalated month had returned to its position just before the month of Nasi' began. If Nasī' meant intercalation, then the number and the position of the intercalary months between AH 1 and AH 10 are uncertain; western calendar dates commonly cited for key events in early Islam such as the Hijra, the Battle of Badr, the Battle of Uhud and the Battle of the Trench should be viewed with caution as they might be in error by one, two, three or even four lunar months. This prohibition was mentioned by Muhammad during the farewell sermon which was delivered on 9 Dhu al-Hijjah AH 10 (Julian date Friday 6 March, 632 AD/CE) on Mount Arafat during the farewell pilgrimage to Mecca. Certainly the Nasi’ is an impious addition, which has led the infidels into error. One year they authorise the Nasi’, another year they forbid it. They observe the divine precept with respect to the number of the sacred months, but in fact they profane that which God has declared to be inviolable, and sanctify that which God has declared to be profane. Assuredly time, in its revolution, has returned to such as it was at the creation of the heavens and the earth. In the eyes of God the number of the months is twelve. Among these twelve months four are sacred, namely, Rajab, which stands alone, and three others which are consecutive. The three successive sacred (forbidden) months mentioned by Prophet Muhammad (months in which battles are forbidden) are Dhu al-Qa‘dah, Dhu al-Hijjah, and Muharram, months 11, 12, and 1 respectively. The single forbidden month is Rajab, month 7. These months were considered forbidden both within the new Islamic calendar and within the old pagan Meccan calendar. Four of the twelve Hijri months are considered sacred: Rajab (7), and the three consecutive months of Dhū al-Qa‘dah (11), Dhu al-Ḥijjah (12) and Muḥarram (1). As the lunar calendar lags behind the solar calendar by about ten days every Gregorian year, months of the Islamic calendar fall in different parts of the Gregorian calendar each year. The cycle repeats every 33 lunar years. 1 Muḥarram مُحَرَّم forbidden A sacred month, so called because battle and all kinds of fighting are forbidden (ḥarām) during this month. Muḥarram includes ‘Āshūrā’, the tenth day. 3 Rabīʿ al-Awwal رَبِيع ٱلْأَوَّل the first spring Also means to graze, because cattle were grazed during this month. Also a very holy month of celebration for many Muslims, as it was the month the Prophet Muhammad was born. 5 Jumādá al-Ūlá جُمَادَىٰ ٱلْأُولَىٰ the first of parched land Often considered the pre-Islamic summer. Jumādá may also be related to a verb meaning "to freeze" and another account relates that water would freeze during this time of year. 7 Rajab رَجَب respect, honour This is the second sacred month in which fighting is forbidden. Rajab may also be related to a verb meaning "to remove", so called because pre-Islamic Arabs would remove the heads of their spears and refrain from fighting. 8 Sha‘bān شَعْبَان scattered Marked the time of year when Arab tribes dispersed to find water. Sha‘bān may also be related to a verb meaning "to be in between two things". Another account relates that it was called thus because the month lies between Rajab and Ramaḍān. 9 Ramaḍān رَمَضَان burning heat Burning is related to fasting as in empty stomach one's worldly desire will burn. Supposedly so called because of high temperatures caused by the excessive heat of the sun. Ramaḍān is the most venerated month of the Hijri calendar. During this time, Muslims must fast from pre-dawn until sunset and should give charity to the poor and needy. 12 Dhū al-Ḥijjah ذُو ٱلْحِجَّة the one of pilgrimage During this month Muslim pilgrims from all around the world congregate at Mecca to visit the Kaaba. The Hajj is performed on the eighth, ninth and the tenth of this month. Day of Arafah takes place on the ninth of the month. Eid al-Adha, the "Festival of the Sacrifice", begins on the tenth day and ends on sunset of the twelfth, and this is a fourth holy month during which war is banned. Each month of the Islamic calendar commences on the birth of the new lunar cycle. Traditionally this is based on actual observation of the crescent (hilal) marking the end of the previous lunar cycle and hence the previous month, thereby beginning the new month. Consequently, each month can have 29 or 30 days depending on the visibility of the moon, astronomical positioning of the earth and weather conditions. However, certain sects and groups, most notably Bohras Muslims namely Alavis, Dawoodis and Sulaymanis and Shia Ismaili Muslims, use a tabular Islamic calendar (see section below) in which odd-numbered months have thirty days (and also the twelfth month in a leap year) and even months have 29. In Arabic, the "first day" of the week corresponds with Sunday of the planetary week. The Islamic weekdays, like those in the Hebrew and Bahá'í calendars, begin at sunset. The Christian liturgical day, kept in monasteries, begins with vespers (see vesper), which is evening, in line with the other Abrahamic traditions. Christian and planetary weekdays begin at the following midnight. Muslims gather for worship at a mosque at noon on "gathering day" (Yawm al-Jum‘ah, yawm يوم meaning "day") which corresponds with Friday. Thus "gathering day" is often regarded as the weekly day of rest. This is frequently made official, with many Muslim countries adopting Friday and Saturday (e.g., Egypt, Saudi Arabia) or Thursday and Friday as official weekends, during which offices are closed; other countries (e.g., Iran) choose to make Friday alone a day of rest. A few others (e.g., Turkey, Pakistan, Morocco, Nigeria) have adopted the Saturday-Sunday weekend while making Friday a working day with a long midday break to allow time off for worship. In pre-Islamic Arabia, it was customary to identify a year after a major event which took place in it. Thus, according to Islamic tradition, Abraha, governor of Yemen, then a province of the Christian Kingdom of Aksum (Ethiopia), attempted to destroy the Kaaba with an army which included several elephants. The raid was unsuccessful, but that year became known as the Year of the Elephant, during which Muhammad was born (sura al-Fil). Most equate this to the year 570 AD/CE, but a minority use 571 CE. In AH 17 (638 AD/CE), Abu Musa Ashaari, one of the officials of the Caliph Umar in Basrah, complained about the absence of any years on the correspondence he received from Umar, making it difficult for him to determine which instructions were most recent. This report convinced Umar of the need to introduce an era for Muslims. After debating the issue with his counsellors, he decided that the first year should be the year of Muhammad's arrival at Medina (known as Yathrib, before Muhammad's arrival). Uthman ibn Affan then suggested that the months begin with Muharram, in line with the established custom of the Arabs at that time. The years of the Islamic calendar thus began with the month of Muharram in the year of Muhammad's arrival at the city of Medina, even though the actual emigration took place in Safar and Rabi' I of the intercalated calendar, two months before the commencement of Muharram in the new fixed calendar. Because of the Hijra, the calendar was named the Hijri calendar. F A Shamsi (1984) postulated that the Arabic calendar was never intercalated. According to him, the first day of the first month of the new fixed Islamic calendar (1 Muharram AH 1) was no different from what was observed at the time. The day the Prophet moved from Quba' to Medina was originally 26 Rabi' I on the pre-Islamic calendar. 1 Muharram of the new fixed calendar corresponded to Friday, 16 July 622 AD/CE, the equivalent civil tabular date (same daylight period) in the Julian calendar. The Islamic day began at the preceding sunset on the evening of 15 July. This Julian date (16 July) was determined by medieval Muslim astronomers by projecting back in time their own tabular Islamic calendar, which had alternating 30- and 29-day months in each lunar year plus eleven leap days every 30 years. For example, al-Biruni mentioned this Julian date in the year 1000 AD/CE. Although not used by either medieval Muslim astronomers or modern scholars to determine the Islamic epoch, the thin crescent moon would have also first become visible (assuming clouds did not obscure it) shortly after the preceding sunset on the evening of 15 July, 1.5 days after the associated dark moon (astronomical new moon) on the morning of 14 July. Though Cook and Crone in Hagarism: The Making of the Islamic World cite a coin from AH 17, the first surviving attested use of a Hijri calendar date alongside a date in another calendar (Coptic) is on a papyrus from Egypt in AH 22, PERF 558. Due to the fact that the Islamic calendar relies on certain variable methods of observation which are used to determine its month-start-dates, the start-dates of its months sometimes vary slightly from the month-start-dates of the astronomical lunar calendar, which are based directly on astronomical calculations. Still, the Islamic calendar seldom varies by more than three days from the astronomical-lunar-calendar system, and roughly approximates it. Both the Islamic calendar and the astronomical-lunar-calendar take no account of the solar year in their calculations, and thus both of these strictly lunar based calendar systems have no ability to reckon the timing of the four seasons of the year. In the astronomical-lunar-calendar system, a year of 12 lunar months is 354.37 days long. In this calendar system, lunar months begin precisely at the time of the monthly "conjunction", when the Moon is located most directly between the Earth and the Sun. The month is defined as the average duration of a revolution of the Moon around the Earth (29.53 days). By convention, months of 30 days and 29 days succeed each other, adding up over two successive months to 59 full days. This leaves only a small monthly variation of 44 minutes to account for, which adds up to a total of 24 hours (i.e., the equivalent of one full day) in 2.73 years. To settle accounts, it is sufficient to add one day every three years to the lunar calendar, in the same way that one adds one day to the Gregorian calendar every four years. The technical details of the adjustment are described in Tabular Islamic calendar. The Islamic calendar, however, is based on a different set of conventions being used for the determination of the month-start-dates. Each month still has either 29 or 30 days, but due to the variable method of observations employed, there is usually no discernible order in the sequencing of either 29 or 30 day month lengths. Traditionally, the first day of each month is the day (beginning at sunset) of the first sighting of the hilal (crescent moon) shortly after sunset. If the hilal is not observed immediately after the 29th day of a month (either because clouds block its view or because the western sky is still too bright when the moon sets), then the day that begins at that sunset is the 30th. Such a sighting has to be made by one or more trustworthy men testifying before a committee of Muslim leaders. Determining the most likely day that the hilal could be observed was a motivation for Muslim interest in astronomy, which put Islam in the forefront of that science for many centuries. Still, due to the fact that both lunar reckoning systems are ultimately based on the lunar cycle itself, both systems still do roughly correspond to one another, never being more than three days out of synchronisation with one another. This traditional practice for the determination of the start-date of the month is still followed in the overwhelming majority of Muslim countries. Each Islamic state proceeds with its own monthly observation of the new moon (or, failing that, awaits the completion of 30 days) before declaring the beginning of a new month on its territory. But, the lunar crescent becomes visible only some 17 hours after the conjunction, and only subject to the existence of a number of favourable conditions relative to weather, time, geographic location, as well as various astronomical parameters. Given the fact that the moon sets progressively later than the sun as one goes west, with a corresponding increase in its "age" since conjunction, Western Muslim countries may, under favorable conditions, observe the new moon one day earlier than eastern Muslim countries. Due to the interplay of all these factors, the beginning of each month differs from one Muslim country to another, during the 48 hour period following the conjunction. The information provided by the calendar in any country does not extend beyond the current month. Due to the somewhat variable nature of the Islamic calendar, in most Muslim countries, the Islamic calendar is used primarily for religious purposes, while the Solar-based Gregorian calendar is still used primarily for matters of commerce and agriculture. Isma'ili-Taiyebi Bohras having the institution of da'i al-mutlaq follow the tabular Islamic calendar (see section below) prepared on the basis of astronomical calculations from the days of Fatimid imams. Turkish Muslims use an Islamic calendar which is calculated several years in advance (currently up to 1444 AH/2022 CE) by the Turkish Presidency of Religious Affairs (Diyanet İşleri Başkanlığı). From 1 Muharrem 1400 AH (21 November 1979) until 29 Zilhicce 1435 (24 October 2014) the computed Turkish lunar calendar was based on the following rule: "The lunar month is assumed to begin on the evening when, within some region of the terrestrial globe, the computed centre of the lunar crescent at local sunset is more than 5° above the local horizon and (geocentrically) more than 8° from the Sun." In the current rule the (computed) lunar crescent has to be above the local horizon of Ankara at sunset. Saudi Arabia uses the sighting method to determine the beginning of each month of the Hijri calendar. 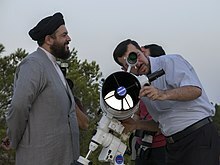 Since AH 1419 (1998/99), several official hilal sighting committees have been set up by the government to determine the first visual sighting of the lunar crescent at the beginning of each lunar month. Nevertheless, the religious authorities also allow the testimony of less experienced observers and thus often announce the sighting of the lunar crescent on a date when none of the official committees could see it. Since 1 October 2016, as a cost-cutting measure, Saudi Arabia no longer uses the Islamic calendar for paying the monthly salaries of government employees but the Gregorian calendar. The Solar Hijri calendar is a solar calendar used in Iran and Afghanistan which counts its years from the Hijra or migration of Muhammad from Mecca to Medina in 622 AD/CE. The Tabular Islamic calendar is a rule-based variation of the Islamic calendar, in which months are worked out by arithmetic rules rather than by observation or astronomical calculation. It has a 30-year cycle with 11 leap years of 355 days and 19 years of 354 days. In the long term, it is accurate to one day in about 2,500 solar years or 2,570 lunar years. It also deviates up to about one or two days in the short term. 1 Muharram: Islamic New Year. 10 Muharram: Day of Ashura. For Sunnis, the crossing of the Red Sea by Moses occurred on this day. For both Shias and Sunnis, the martyrdom of Husayn ibn Ali, the grandson of Muhammad, and his followers. 12 Rabi al-Awwal: Mawlid or Birth of the Prophet for Sunnis. 17 Rabi al-Awwal: Mawlid for Shias. 27 Rajab: Isra and Mi'raj for the majority of Muslims. 15 Sha'ban: Mid-Sha'ban, or Night of Forgiveness. For Twelvers, also the birthday of Muhammad al-Mahdi, the Twelfth Imam. 1 Ramadan: First day of fasting. Last third of Ramadan which includes Laylat al-Qadr. 8–13 Dhu al-Hijjah: The Hajj to Mecca. 9 Dhu al-Hijjah: Day of Arafa. 10 Dhu al-Hijjah: Eid al-Adha. 21 Ramadan: Martyrdom of Ali ibn Abi Talib. 3 Sha'ban: Birthday of Husayn ibn Ali. 9 Rabi' al-Awwal: Eid-e-Shuja' (Revenge taken by Mukhtar al-Thaqafi). 6 Rajab: Urs of Moinuddin Chishti. Generally the sixth day of every month is celebrated and observed as Chatthi. 11 Rabi' al-Akhir: Urs of Abdul-Qadir Gilani. Generally the 11th day of every month is celebrated and observed as Gyarvi. Conversions may be made by using the Tabular Islamic calendar, or, for greatest accuracy (one day in 15,186 years), via the Jewish calendar. Theoretically, the days of the months correspond in both calendars if the displacements which are a feature of the Jewish system are ignored. The table below gives, for nineteen years, the Muslim month which corresponds to the first Jewish month. This table may be extended since every nineteen years the Muslim month number increases by seven. When it goes above twelve, subtract twelve and add one to the year AH. From 412 AD/CE to 632 AD/CE inclusive the month number is 1 and the calculation gives the month correct to a month or so. 622 AD/CE corresponds to BH 1 and AH 1. For earlier years, year BH = (623 or 622) – year AD/CE). An example calculation: What is the civil date and year AH of the first day of the first month in the year 20875 AD/CE? We first find the Muslim month number corresponding to the first month of the Jewish year which begins in 20874 AD/CE. Dividing 20874 by 19 gives quotient 1098 and remainder 12. Dividing 2026 by 19 gives quotient 106 and remainder 12. 2026 is chosen because it gives the same remainder on division by 19 as 20874. The two years are therefore (1098–106)=992×19 years apart. The Muslim month number corresponding to the first Jewish month is therefore 992×7=6944 higher than in 2026. To convert into years and months divide by twelve – 6944/12=578 years and 8 months. Adding, we get 1447y 10m + 20874y – 2026y + 578y 8m = 20874y 6m. Therefore, the first month of the Jewish year beginning in 20874 AD/CE corresponds to the sixth month of the Muslim year AH 20874. The worked example in Conversion between Jewish and civil dates, shows that the civil date of the first day of this month (ignoring the displacements) is Friday, 14 June. The year AH 20875 will therefore begin seven months later, on the first day of the eighth Jewish month, which the worked example shows to be 7 January, 20875 AD/CE (again ignoring the displacements). The date given by this method, being calculated, may differ by a day from the actual date, which is determined by observation. A reading of the section which follows will show that the year AH 20875 is wholly contained within the year 20875 AD/CE, also that in the Gregorian calendar this correspondence will occur one year earlier. The reason for the discrepancy is that the Gregorian year (like the Julian, though less so) is slightly too long, so the Gregorian date for a given AH date will be earlier and the Muslim calendar catches up sooner. The Islamic calendar is now used primarily for religious purposes, and for official dating of public events and documents in Muslim countries. Because of its nature as a purely lunar calendar, it cannot be used for agricultural purposes and historically Islamic communities have used other calendars for this purpose: the Egyptian calendar was formerly widespread in Islamic countries, and the Iranian calendar and the 1789 Ottoman calendar (a modified Julian calendar) were also used for agriculture in their countries. In the Levant and Iraq the Aramaic names of the Babylonian calendar are still used for all secular matters. In Morocco, the Berber calendar (another Julian calendar) is still used by farmers in the countryside. These local solar calendars have receded in importance with the near-universal adoption of the Gregorian calendar for civil purposes. The Saudi Arabia uses the lunar Islamic calendar. In Indonesia, the Javanese calendar, created by Sultan Agung in 1633, combines elements of the Islamic and pre-Islamic Saka calendars. British author Nicholas Hagger writes that after seizing control of Libya, Muammar Gaddafi "declared" on 1 December 1978 "that the Muslim calendar should start with the death of the prophet Mohammed in 632 rather than the hijra (Mohammed's 'emigration' from Mecca to Medina) in 622". This put the country ten solar years behind the standard Muslim calendar. However, according to the 2006 Encyclopedia of the Developing World, "More confusing still is Qaddafi's unique Libyan calendar, which counts the years from the Prophet's birth, or sometimes from his death. The months July and August, named after Julius and Augustus Caesar, are now Nasser and Hannibal respectively." Reflecting on a 2001 visit to the country, American reporter Neil MacFarquhar observed, "Life in Libya was so unpredictable that people weren't even sure what year it was. The year of my visit was officially 1369. But just two years earlier Libyans had been living through 1429. No one could quite name for me the day the count changed, especially since both remained in play. ... Event organizers threw up their hands and put the Western year in parentheses somewhere in their announcements." Hijri support was available in later versions of traditional Visual Basic, and is also available in the .NET Framework. ^ a b Watt, W. Montgomery. "Hidjra". In P.J. Bearman; Th. Bianquis; C.E. Bosworth; E. van Donzel; W.P. Heinrichs. Encyclopaedia of Islam Online. Brill Academic Publishers. ISSN 1573-3912. ^ Hijri Calendar, Government of Sharjah, retrieved 21 January 2017 . ^ a b c d F.C. De Blois, "TA’RĪKH": I.1.iv. "Pre-Islamic and agricultural calendars of the Arabian peninsula", The Encyclopaedia of Islam, 2nd edition, X:260. ^ a b c A. Moberg, "NASI'", The Encyclopaedia of Islam, 2nd, VII: 977. ^ For an overview of the various theories and a discussion of the problem of "hindsight chronology" in early and pre-Islamic sources, see Maurice A. McPartlan, The Contribution of Qu'rān and Hadīt to Early Islamic Chronology (Durham, 1997). ^ Muḥammad al-Khuḍarī Bayk (1935). Muḥāḍarāt tārīkh al-Umam al-Islāmiyya. 2 (4th ed.). Al-maktaba al-tijāriyya. pp. 59–60. ^ The Encyclopedia of Islam, 2nd edition, Index, p. 441. ^ a b c d al-Biruni (tr. C. Edward Sachau. "Intercalation of the Ancient Arabs", The Chronology of Ancient Nations. London: William H. Allen, 1000/1879. pp. 13–14, 73–74. ^ A. Moberg, "NASI'", E.J. Brill's first encyclopaedia of Islam. ^ Bonner 2011, page 21. ^ al-Biruni, The chronology of ancient nations, tr. C. Edward Sachau (1000/1879) 141. ^ From an illustrated manuscript of Al-Biruni's 11th-century Vestiges of the Past (Bibliothèque Nationale, Paris, Arabe 1489 fol. 5v. (Bibliothèque Nationale on-line catalog). See also: Robert Hillenbrand, "Images of Muhammad in al-Bīrūnī's Chronology of Ancient Nations", in: R. Hillenbrand (ed. ), Persian Painting from the Mongols to the Qajars: Studies in Honour of Basil W. Robinson (London/New York: I.B. Tauris Publishers, 2000), pp. 129–46. ^ Sherrard Beaumont Burnaby, Elements of the Jewish and Muhammadan calendars (London: 1901) 370. ^ "Center for Muslim-Jewish Engagement". usc.edu. Archived from the original on 28 August 2014. ^ Richards, E. G. (2012). "Calendars" (PDF). In Urban, Sean E.; Seidelmann, P. Kenneth. Explanatory Supplement to the Astronomical Almanac. Mill Valley, CA: University Science Books. p. 606. ISBN 978-1-891389-85-6. ^ Hanif, Muhammad (18 February 2010). "The significance of the 12th of Rabi al - Awwal". Minhaj - ul - Quran. Retrieved 14 June 2016. ^ "Calendrica". Archived from the original on 16 February 2005. ^ "NASA phases of the moon 601–700". Archived from the original on 8 October 2010. ^ Emile Biémont, Rythmes du temps, Astronomie et calendriers, De Borck, 2000, 393p. ^ Karim Meziane et Nidhal Guessoum: La visibilité du croissant lunaire et le ramadan, La Recherche n° 316, janvier 1999, pp. 66–71. ^ "Calculations or Sighting for starting an Islamic month". www.moonsighting.com. Archived from the original on 8 May 2017. Retrieved 16 April 2017. ^ Oumma (23 June 2010). "Le mois islamique est-il universel ou national ?". Oumma. ^ Allal el Fassi : "Aljawab assahih wannass-hi al-khaliss ‘an nazilati fas wama yata’allaqo bimabda-i acchouhouri al-islamiyati al-arabiyah", "[...] and the beginning of Islamic Arab months", report prepared at the request of King Hassan II of Morocco, Rabat, 1965 (36 p.), with no indication of editor. ^ "Interpretation of the Meaning of The Noble Quran Translated into the English Language By Dr. Muhammad Taqi-ud-Din Al-Hilali Ph.D. & Dr. Muhammad Muhsin Khan". Archived from the original on 27 January 2010. ^ "أوائل الشهور العربية .. هل يجوز شرعاً إثباتها". ^ "Fiqh Council of North America Islamic lunar calendar". Archived from the original on 16 May 2008. ^ "Zulfikar Ali Shah The astronomical calculations: a fiqhi discussion" (PDF). Archived from the original (PDF) on 9 August 2008. ^ "Islamic Center of Boston, Wayland" (PDF). ^ Oumma (19 July 2012). "Le Conseil Français du Culte Musulman (CFCM): Ramadan moubarak!". Retrieved 15 January 2019. ^ Nidhal Guessoum (5 July 2012). "Quel sera le premier jour du mois de Ramadan 2012? (On which date will Ramadan 2012 begin?)". Retrieved 15 January 2019. ^ "The Islamic Calendar of Turkey". ^ "The Umm al-Qura Calendar of Saudi Arabia". ^ "Log in - Meetup". progmuslim.meetup.com. ^ "Saudi Arabia adopts Gregorian calendar". 8 October 2016. ^ The prince’s time machine: Saudi Arabia adopts the Gregorian calendar The Economist, Dec 17th 2016. ^ Persian Pilgrimages by Afshin Molavi. Books.google.com. Retrieved 2012-08-11. ^ The "Kuwaiti Algorithm" (Robert van Gent). ^ Gast, M.; Delheur, J.; E.B. "Calendrier". Encyclopédie Berbère, 11 (Bracelets – Caprarienses) (in French). OpenEdition. Retrieved 5 July 2018. ^ the start of each lunar month determined not ahead of time by astronomical calculation, but only after the crescent moon is sighted by the proper religious authorities. (source: Tripp, Culture Shock, 2009: p.154-5). ^ Neil MacFarquhar (2010). The Media Relations Department of Hizbollah Wishes You a Happy Birthday: Unexpected Encounters in the Changing Middle East. ReadHowYouWant. ISBN 978-1-4587-6009-8. pages 37–38. ^ exact dates depend on which variant of the Islamic calendar is followed. "Hegira" . Encyclopedia Americana. 1920. This page was last edited on 20 April 2019, at 11:41 (UTC).